How Do You Spell POSTER? 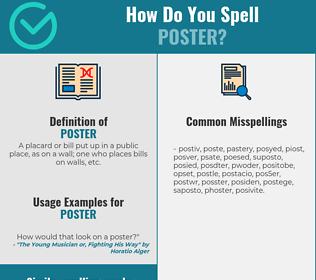 Correct spelling for the English word "poster" is [p_ˈəʊ_s_t_ə], [pˈə͡ʊstə], [pˈə‍ʊstə]] (IPA phonetic alphabet). Below is the list of 330 misspellings for the word "poster". A placard or bill put up in a public place, as on a wall; one who places bills on walls, etc.